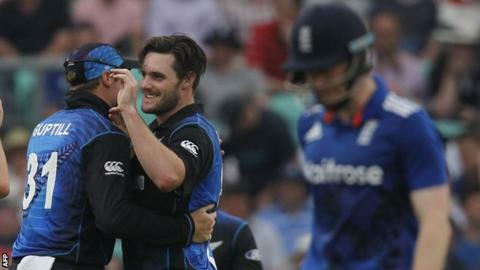 England suffered a 13-run Duckworth-Lewis loss in the second one dayer against New Zealand in a game that produced the highest number of runs ever seen in an ODI on English soil. Chasing a record 399, England attacked from the off with Alex Hales scoring 54 and Eoin Morgan hitting 88 in 47 balls. Rain halted play with England needing 54 from 37 balls and the revised target of 34 from 13 proved too great. Ross Taylor top-scored for New Zealand with an unbeaten 119 off 96 balls. Kane Williamson scored 93 for the tourists in a game that produced an aggregate of 763 runs, beating the previous best in England by 112. The circumstances of the defeat will be hard for England to take, particularly after a 70-run eighth-wicket stand between Adil Rashid and Liam Plunkett prior to the rain had given them hope of another remarkable victory to follow their record-breaking one at Edgbaston earlier in the week. The 50-minute delay halted the momentum of the Yorkshire pair, who fell in the closing overs - Plunkett for 44 off 30 and Rashid for 34 off 26 - leaving Steven Finn and Chris Jordan with an impossible task. However, that England even got near to chasing down such a huge total - the biggest they have ever conceded in this format - is a testimony to the positivity of this new side and the progress they have made in such a short space of time. Morgan epitomised this during the chase, coming to the wicket after the second of three quick wickets had fallen to bring to a halt the early innings momentum given to the home side by Alex Hales and Jason Roy (who made amends for his golden duck at Edgbaston with a composed 39) in a quick-fire opening stand of 85. The skipper - firstly with Ben Stokes (28 from 17 balls) - and then first-match centurion Buttler (41 off 38) built on this platform during a superb period of play in the middle overs that took the hosts from 100-3 to 259 at a pace previously alien to England one-day sides. That England's assault continued after Morgan had been dismissed by Mitchell McClenaghan through Plunkett and Rashid is a testimony to the way this new mentality has been embraced by this set of England players. Earlier, New Zealand's batting had been just as spectacular and far more in keeping with what they showed at the recent World Cup than the display they produced three days ago, when only Williamson and Taylor got to grips with the England bowling in pursuit of a huge total. Taylor and Williamson were the star performers again for the tourists, but they had able assistance from the rest of the top order in setting an imposing total of their own. Captain Brendon McCullum was typically aggressive, scoring 39 from 22 balls, Martin Guptill was more considered as he scored exactly 50, while Grant Elliott (32) and Luke Ronchi (33) provided some big late-order hitting to take the Black Caps to their second-highest ever - and ultimately match-winning - ODI total. However, it was not all positive news for New Zealand with the news that all-rounder Corey Anderson will miss the remainder of the series to fly home for treatment on a back injury.